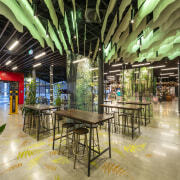 Heightened expectations – the raised corner of Christchurch’s new EntX Entertainment Central optimises views into the Canterbury nature-themed hospitality hub, including the soaring three-level atrium. 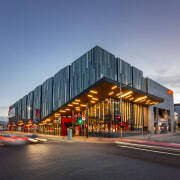 The decimating 2010 and 2011 Christchurch earthquakes changed the face of the garden city forever, including the face of cinema. 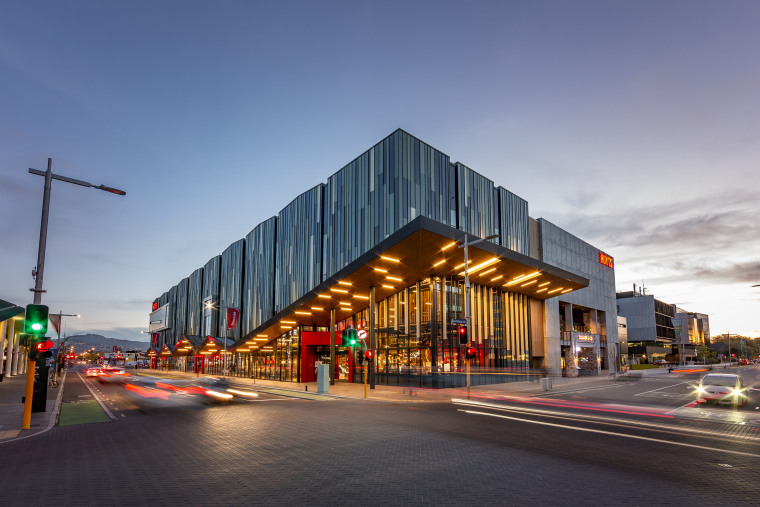 Now the new EntX Entertainment Central multi-cinema and dining complex, developed and owned by Calder Stewart and designed by Ignite Architects, offers a truly eye-catching replacement to what has gone before. 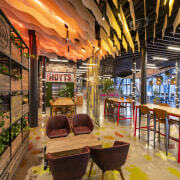 Having heard that Hoyts was looking to create a flagship venue in the CBD, Calder Stewart approached the cinema chain with a potential site, says project director Mark Weaver. Most of all, the developer felt the city needed a vibrant new entertainment hub right at its heart. The soaring three-level atrium in the new EntX Entertainment Central provides a dramatic entry into the nature-themed hospitality hub. However, before construction could begin, issues of land contamination had to be addressed and then the land had to be strengthened. The latter was achieved by introducing 1000 stone columns to increase the density and bearing of the soil. The block-length building is comprised of two quite distinct halves. 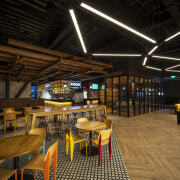 To meet exacting acoustic requirements, the cinemas are constructed as concrete boxes – the solid form of construction helping to anchor the building. The precast concrete facade panels are textured for visual interest. 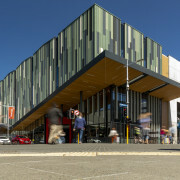 The conjoined eastern half of the building – the high atrium and dining precinct – is by contrast a lightweight steel structure. Because of the length of the building, it is split into two in the middle with a big seismic joint that runs east to west – if there’s another seismic event, the building will move at that point, minimising wider damage and risk. Project leader for Ignite, associate Jamie Irvine says the exterior of this side of the EntX complex responds to its immediate and wider surroundings. 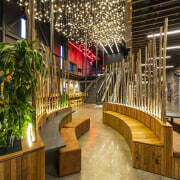 “While the cinema component is boldly faced in concrete, the dining/atrium side of the building features vertical, variously toned strip cladding interspersed with vertical, slender glazing,” says Irvine. In addition, the distinctive metal cladding meets the street-level glazing in a zigzagging line, calling to mind the mighty peaks of the Southern Alps. 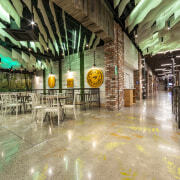 A sightline runs right through the food concourse at EntX Entertainment Central, designed by Ignite Architects. 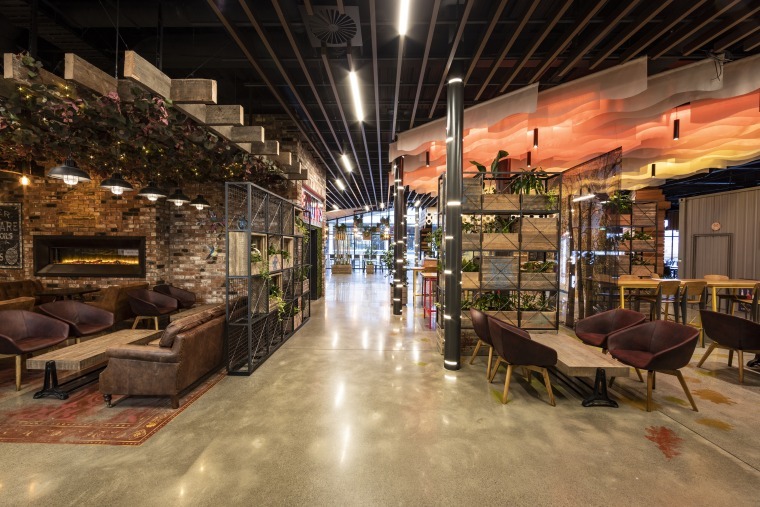 Inside, references to the Canterbury countryside continue with a multifaceted fit-out sectioned into zones that evoke different forests and seasons. 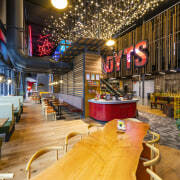 From high-profile archway entry points in the red Hoyts livery, diners and cinema patrons move through the triple-height atrium and concourse that starts with an open ‘glade’ aesthetic and continues to a more enclosed ‘grove’ feel deeper in the building. 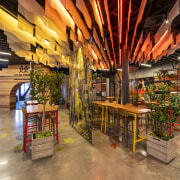 Feature chandeliers, floor motifs, strip battens, full-height columns echoing tree trunks, colour-changing hanging canopies, transparent etched screens and floor stencils all contribute to the natural theme. There are even planters with real plants that will grown into the design over time. 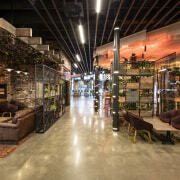 All this adds up to an immersive, entertaining environment to rival the movies screening above – essentially the concourse offers a green retreat in the inner city. 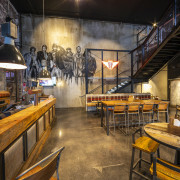 In acknowledgement of the past, elements such as recycled brick and heritage timbers were also incorporated into various aspects of the design. Phones off, lights down, popcorn open and the Lux cinema on the top floor of the new EntX Entertainment Central is ready to entertain you. 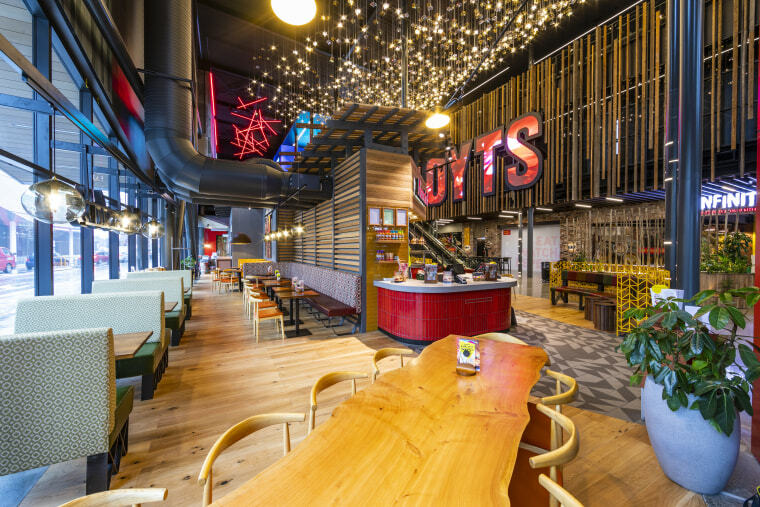 The Hoyts fit-out was by CMP Construction. Stair connectors to the cinemas are in high prominence and the upper levels of the cinema floors look down over the concourse atrium. 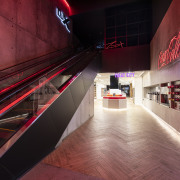 The cinemas in the concrete component are over three levels, with the cinema lobby located across on the hospitality side of the building, on the first floor. The luxurious Lux lounge and cinemas are on the top floor. 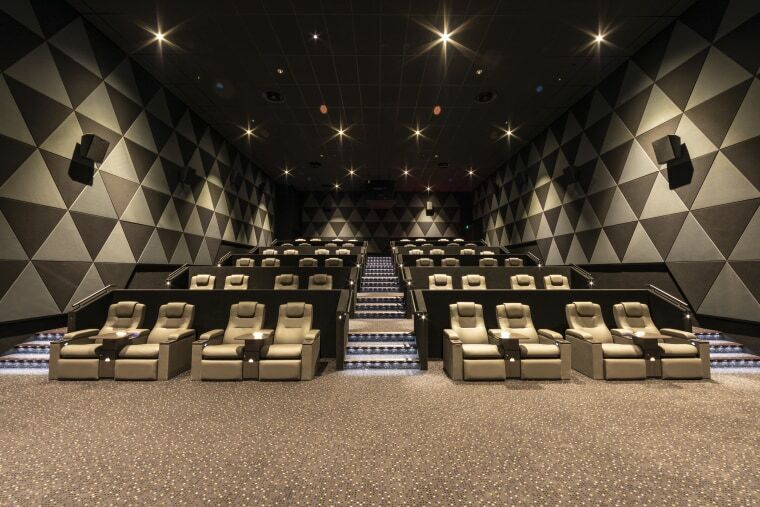 Some of the state-of-the art cinemas include the highest quality sound systems in New Zealand and extra large screens.